The term mountaineering backpack encompasses a very broad range of items. A mountaineering backpack (e.g. Mammut backpack for tours or Gregory alpine backpack) can be a large Daypack for hikes, a technical alpine backpack or a small trekking backpack. Generally, the term mountaineering backpack refers to a robust backpack, with all the alpine necessities, which is used for activities in the mountains and in the snow such as snowboarding and ski trips, mountaineering and glacier hiking. Even outdoor sports like (alpine) climbing and (mountain) hiking often require large or specially equipped and robust backpacks that fall under the category of touring backpack. 20-30 liters in volume: Suitable for daylong tours and minimalists with little gear. Particularly suitable for: Ski tours, hiking, climbing. 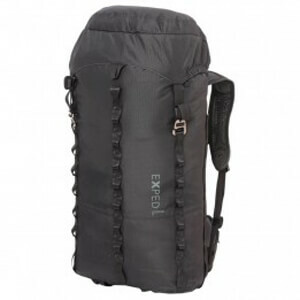 30-40 liters in volume: Suitable for one to three day tours or short trips with lots of gear while hiking, mountain climbing, mountaineering or on long alpine climbing tours. Since these are only broad guidelines, you should always pay attention to the recommended use of the touring backpack as well as the robustness of the material and the carrying system (loading)! Unlike hiking and cycling backpacks, mountaineering backpacks are generally high, slim and tight fitting. This is the only way to ensure that the luggage remains firmly on the back even in rugged terrain and while carrying heavy loads. Instead of creating a space between your back and the backpack (mesh back system), the mountaineering backpack is characterized by its stable position right next to your back. That the ventilation suffers as a result is not as significant, if one considers that such backpacks are quite at home in the mountains. The materials used in making mountaineering backpacks are tailored towards durability and abrasion-resistance. A high level of robustness must be guaranteed regarding contact with rock and ice. Only a few models are less robust and specially designed for activities involving small loads (Speed hiking). In order to satisfy the requirements of usage with gloves and in snow and ice, mountaineering backpacks come with some special fittings. Apart from ski and snowboard holders, most models also possess attachments for ice tools, poles, carabiners and ropes. Few models are coated and thus waterproof. They come with a roll closure. Small details like a separate pocket for avalanche probes and an emergency whistle add that little bit of flair to a mountaineering backpack!